Sometimes it feels as if the Civil Rights movement never happened, Truthseekers. The recent uptick on police violence against unarmed black men, with frequently lethal consequences, is more than a minor comment on the state of race relations today. Could it be that having a black man (and he's just as white as he is black) in the White House was enough to unearth the dark, bigoted underbelly of so many nascent racists in America? And the younger generation is not immune from this disease. Witness the Oklahoma University frat boys joking and chanting about not letting "niggers" into their organization. And Connecticut College closed its doors last month after hate-filled racist graffiti was scrawled on campus buildings. Today's headlines bring news of a group of prospective black college students harassed with racial slurs by hotel staff at an Econo-Lodge near Tallahassee, Florida. We are raising a fresh crop of haters. "Following the election of the town's first African-American mayor, five of the six officers on a small Missouri town police force resigned en masse, reports KFVS. 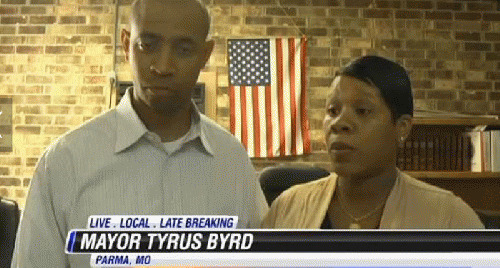 "Former city clerk Tyrus Byrd was sworn in as mayor of Parma, Missouri on Tuesday only to find out that police officers, as well as the city attorney and a water treatment supervisor, had resigned before she took office. "According to outgoing Mayor Randall Ramsey, who is stepping down after 37 years in town hall over two terms, the city employees gave no prior notice. "Residents of the town, some pointing out that the town was probably over-staffed with police, were unconcerned about their safety after the two full-time and three part-time officers quit. "'I think it was pretty dirty the way they all quit without giving her a chance,' resident Martha Miller said." These public employees allegedly resigned over "safety concerns," yet none would describe the nature of their fears. Did they believe Mayor Byrd was going to rob them at staff meetings? Make them participate in some kind of African voodoo ritual? They're not talking. Racists are funny that way. White hoods conceal their faces, and big burning crosses speak louder than words.